Winemakers have been too modest for too long about their fresh, mineral wines from unique varieties, says Sarah Ahmed. It’s time to lift the lid on ‘Europe’s best-kept-secret’. If the Brits are known for their reserve, the Portuguese elevate it to a new level. Take the advertising campaign which declared Portugal’s wines ‘the best-kept secret in Europe’. Or the country’s whites, which are as softly spoken and understated as many of its winemakers. But where the vogue for obscure varieties and fresher, lighter, mineral styles coincides with a quantum leap in white wine quality, it’s time to shout, not whisper about its strengths! For upfront appeal with finesse, Alvarinho – Spain’s Albariño – is the go-to grape and Moncão e Melgaço the go-to place. 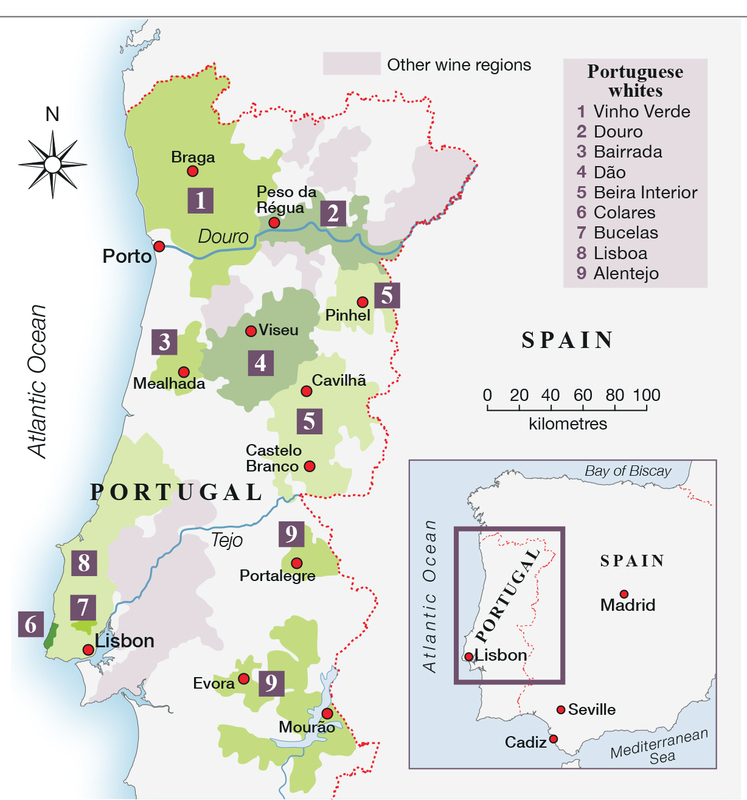 Nowhere else in Portugal have so many specialists (more than 30) so intently focused on one white grape as in this sub-region of the Vinho Verde DOC (Denominação de Origem Controlada). Here, Alvarinho has incomparable aromatics, tension and minerality wed to a concentration stemming from lower yields and being Vinho Verde’s warmest, driest spot. An exciting range of expressions abound, and the best wines can develop beautifully in bottle – for a decade or more in the case of high fliers Quinta de Soalheiro and Anselmo Mendes. Although Alvarinho is planted throughout Portugal, the country’s best whites are all about the intricate interplay of grape, region and site. In Lima, another Vinho Verde sub-region, Loureiro attains greater focus and mineral complexity (ageworthiness too, at Quinta do Ameal and Aphros). Like Loureiro, Arinto is a popular blending partner which excels on its own in the right place. In Bucelas, one of the DOCs of the generic Vinho Regional (VR) of Lisboa, Arinto’s high acidity earned it the 19th-century moniker Lisbon Hock. Cool Atlantic breezes funnelling down the Trancão river valley accentuate its steely acid backbone, the perfect foil for the tropical citrus profile gifted by Bucelas’ sun-kissed calcareous slopes. Only a handful of producers keep the faith. Best is Quinta da Romeira, though under new French ownership, Quinta da Murta is a name to watch. Limestone soils are propitious elsewhere too. In Bairrada DOC, Filipa Pato even calls her flagship white, made from Bical, Calcário. She, her father Luís Pato, Quinta das Bágeiras and Campolargo demonstrate this maritime region’s flair for fresh, mineral whites from not just Bical, but Maria Gomes and Cercial too. In hitherto humdrum Lisboa VR, the potential of pockets of Jurassic limestone and clay is at last being exploited for whites. Pedro Marques (Vale da Capucha) farms organically to convey the fresh salinity which comes from fossil-strewn calcareous slopes near the coast. Marta Soares (Casal Figueira) and André Manz (Manz) have resuscitated two Lisboa grapes, Vital and Jampal, to thrilling effect. They are not alone in placing greater value on tradition. Squeezed out by Lisbon’s encroachment, only 12ha of Colares DOC’s ungrafted, untrellised vines remain. Less than a kilometre from the ocean, they sprawl across sand, protected from the wind by dry-stone walls and wicker fences. Newcomers Casca Wines and Casal de Santa Maria are coaxing out the charms of Malvasia de Colares, as well as stalwarts Adega Colares and Adega Viúva Gomes. Its brisk, salty, manzanilla tang is the product of this unique terroir and old-school winemaking: skin contact and maturation in old hardwood toneis (large casks). Similarly enclosed by walls, the vineyards of the volcanic Azores island of Pico have also received an injection of fresh blood. António Maçanita of Fita Preta’s taut, mineral Terrantez do Pico and Arinto do Açores invite comparison to Santorini’s Assyrtiko. On his home turf of Alentejo, Maçanita is one of a number of producers reviving the use of talha (amphorae). They give a softer, more oxidative profile to his Signature Series Branco, a classic Alentejo blend of Roupeiro and Antão Vaz. Landlocked, warmer, drier regions like Alentejo, which are better known for reds, typically produce blends from a cocktail of local varieties. Acidity enhancing elevation means that mountainous regions like the Douro, Dão and Beira Interior can produce surprisingly firm, focused wines. With the exception of Beira Interior’s racy, citrus-fuelled Síria (exemplified by Quinta do Cardo and Beyra), fuller-bodied whites tend towards the savoury/textural rather than aromatic/fruity. Expect vegetal notes of green olive, resin and celery, the ‘flinty’ struck match of lees-stirring and nutty, spicy oak. Schist and granite mountain soils contribute minerality. Down south, Alentejo DOC’s sun-baked plains are more challenging, which explains why its cooler, mountainous northern subregion of Portalegre in Serra de São Mamede attracted esteemed winemakers Rui Reguinga and Susana Esteban and talented mavericks like Lisboa chef Vitor Claro (Dominó) and wine writer João Afonso (Quinta das Cabeças). Old field-blend (varietally mixed) vineyards (also commonly found in the Douro) are part of the character-building magic which puts the emphasis on terroir not variety. Character sums up Portugal’s best whites. Their singularity gives geek appeal but, with mineral complexity, texture and structure, lovers of Riesling and Burgundy are well-served too. Plus there’s an advantage of being under the radar – the value for money which saw UK exports more than triple last year. Sarah Ahmed is the Decanter World Wine Awards Regional Chair for Portugal. See the Portugal awarding winning whites wines here.